Weird Places? We are there! On this week’s episode, Harley and Brett are feeling a little rusty, but excited about a little place called Baird, Texas. Brett doesn’t believe in the thrill of the hunt, but he does believe in the power of antiques. The Mystery of the Spider Rocks is all about Coronado’s mythical stash of gold from the seven cities of Cibola or about the gold of the Spanish conquistadors from the early 1700s. The Spider Rocks are not giant spider eggs nor do they have anything to do with Spiderman. Where should you start your hunt for the gold? Baird TX is hot, but there is still a lot to do in the area. 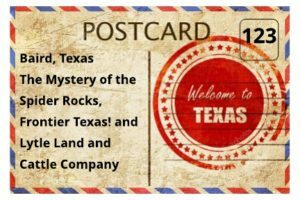 If you aren’t on the hunt for treasure, Frontier Texas! is a world class interactive museum and visitor center located in downtown Abilene, Texas. Lytle Land and Cattle Company may be the treasure you have really been looking for…..Texans know their steak. Help us keep the show running by joining our Patreon! You can share original art, clips, show ideas, trip reports or writing a blog entry for our page.